Compare God-Pharaoh’s Gift to Debtors’ Knell. Remember: Debtors’ Knell was a breaker in both Ravnica Block Constructed and in the Standard of its era! Both cards cost seven mana. However, the new version is a colorless artifact; consequently, it is an easier seven than Debtors’ Knell to get into play. Above and beyond Debtors’ Knell, though, God-Pharaoh’s Gift grants haste! Take that, opponent! Champion of Wits has been making and breaking all kinds of decks in its short — yet already storied — career. Champion of Wits is a key enabler of this artifact. 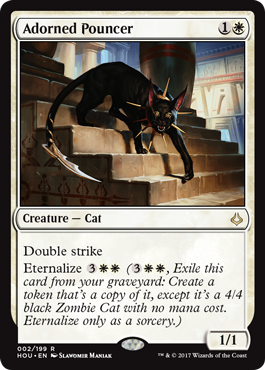 God-Pharaoh’s Gift wants you to put creatures into your graveyard. After all, it is from the graveyard that the dead will rise (and hastily attack). 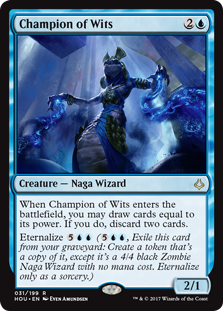 Champion of Wits specializes in putting cards — creatures or otherwise — into the graveyard. It helps dig to your God-Pharaoh’s Gift (or proxy for). A creature itself, when you return a Champion of Wits, it comes back as a 4/4 creature so you draw even more cards! You can discard God-Pharaoh’s Gift itself to the graveyard. Why would you want to do that? Champion of Wits costs three mana. The very next turn you can Refurbish the God-Pharaoh’s Gift directly onto the battlefield! The card is the easiest possible seven mana. But how sweet is it when you play it for just four? 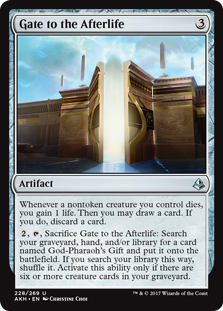 Another three mana facilitator to God-Pharaoh’s Gift is Gate to the Afterlife. I’d say drawing and discarding cards helps you dig to your key spell… But that’s not even necessary here. Once you have six creatures in the graveyard (whether from looting, or discarding to Champion of Wits, chump blocking) you can just switch one artifact for the other. For more on this great strategy, more Champion of Wits, and lots and lots more Mono-Red in Standard, check out this week’s podcast now! Nicol Bolas, God-Pharaoh is already exceeding expectationsSo how are we going to play Nicol Bolas, God-Pharaoh? There are so So SO many ways! A dedicated Planeswalker control deck with lots of cards that can interact with the opponent’s threats is a great home for Nicol Bolas. It’s a redundancy on your other permanents, can borrow against the architecture of the rest of your deck, and ultimately just presents an even more powerful threat than the rest of your deck. You can play an Energy Aggro deck, complete with Longtusk Cub and Bristling Hydra… And just finish with Bolas. This use of the card just requires you to deal thirteen damage in the first seven turns. Pretty trivial, right? You can just play the big Planeswalker for seven, to deal seven. 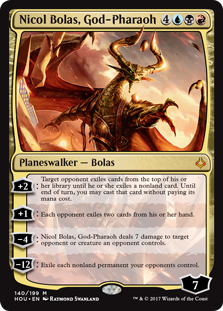 Not only is Nicol Bolas the best “Demonfire” we’ve had in years (especially given the seven-for-seven mana cost)… If for some reason something went wrong, you would still have a Planeswalker to help over the next few turns. An Energy deck is actually particularly great for this… Because Energy is somewhat spotty to come by, you might find yourself stranded with Nicol Bolas in hand, but not the mana to cast it. The Aether Hubs of the Energy strategy go a long way in ensuring the solo black (or whatever is needed) is available, versus being stranded as a colorless. Resilient Khenra is one of several aggressive cards covered in this beatdown-oriented episode.Hour of Devastation brings several aggressive options to Standard. 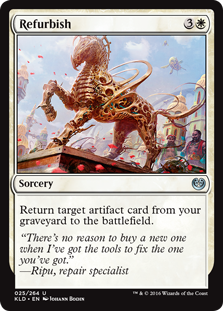 We’ve mostly talked about powerhouse cards like Hour of Devastation [the card], or big ramp spells like Hour of Promise so far… But the new set can also turn a mean Jackal sideways! To start, this card is a 2/2 creature for 1G… Any text on it is going to put it past the classic Grizzly Bears. The question is whether you can afford to play Resilient Khenra in a world that has optimized out Duskwatch Recruiter and Sylvan Advocate. We think… Maybe. For one thing, Sylvan Advocate has largely lost on the presence of Fatal Push. Later in the game, when Sylvan Advocate is meant to get big, it still has a tiny two in the top-right… Making it a great target for Fatal Push. Resilient Khenra doesn’t have the same problem. It leaves a body, yes, but pushing the tempo with its 187 buff effect is the main reason you choose this card. If you start on an Adorned Pouncer, and follow up with Resilient Khenra, you don’t merely get +2/+2… You get to exploit the double strike on Adorned Pouncer. So for only two mana, you get four extra damage (and keep the Jackal Wizard body). Later in the game, the two creatures’ Eternalize abilities curve one into the next. Adorned Pouncer costs five to Eternalize, and Resilient Khenra costs six. 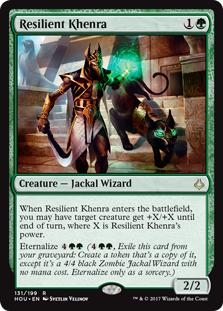 In the late-game case, Resilient Khenra provides +4/+4 due to the token’s superior size, so the multiplier is that much more dangerous. The G/W color combination isn’t limited to Eternalize guys in Hour of Devastation. What about Appeal // Authority? In a tokens deck specifically, Appeal can deal a huge amount of extra damage for only one mana, while Authority hearkens back to Alexander Hayne’s Block Constructed PT win from a few years back. Together, they may make a splash. Luckily, they’re always together. Red has long had the ability to deal two to three points of damage to multiple creatures for about three mana. Examples include Standard Staples like Kozilek’s Return, Radiant Flames, or Sweltering Suns. Forget about the fact that it can deal with Planeswalkers directly at all, the fail state of this card falls into a convenient place. What is the kind of deck where you would want Hour of Devastation? Something like Zombies, right? 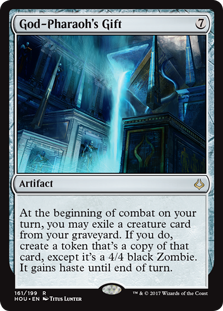 A deck where the opponent plays multiple creatures, that sometimes get big… The ability to deal five to all of them is quite attractive against Zombies. But what about when you don’t want a big creature sweeper? Oftentimes, the opposite number to Zombies will be a Control deck. Those decks will very often give you one or more Planeswalkers to kill, especially board control decks. 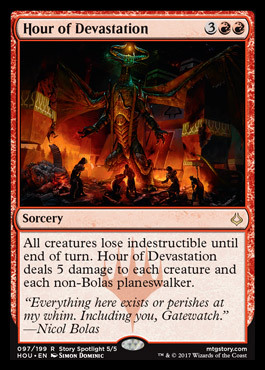 Hour of Devastation (red) is highly complimentary to other key Grixis cards. For example, this card does five… And Torrential Gearhulk has six toughness. It’s one thing for Torrential Gearhulk to live through the Hour… But what about being able to swing directly? Turn 7 – Play a land; cast it leaving up UU. Get in there for five!